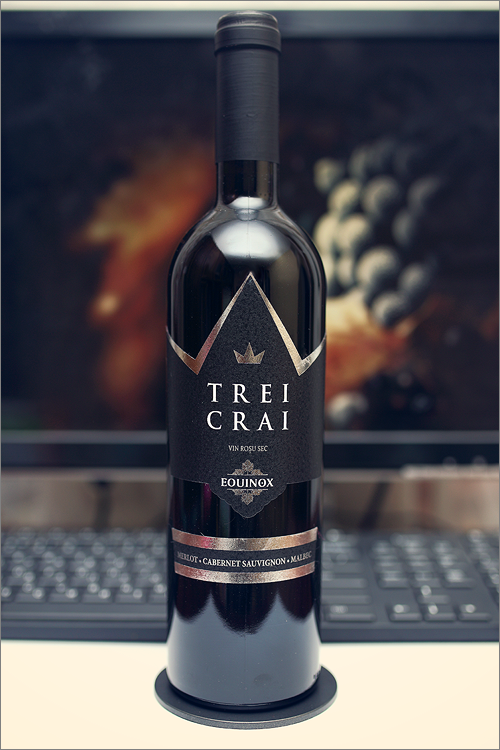 Moving on with Wine of Moldova and still on the wine blend theme for a reason – tonight we are going to review a wine, that struck the market incognito but became a hit right away – Trei Crai 2013 from Equinox. This is a mix between Bordeaux, Cahor and Rhone philosophy of blending wines, with only 3 main grape varieties in it – la Trinità Sancta, also, it is the first wine with no additive in Moldova. So, without further theory, let’s get to the most delightful part of the review – the wine tasting. The wine has a noble, deep and opaque garnet-purple color, with the rim-color displaying clear purple shades. The nose is clean and strong, with no signs of wine faults. The very first nose reveals a mix of blue fruits and some nuanced stone fruits notes: sour cherry, black currant, black cherry, leather, red plum, blackberry, wildberry, black tea, vanilla, red peeper, tree bark, sweet tobacco and a mesmerizing aroma of dried lavender. The wine is dry, with no signs of residual sugar. It has high, but well integrated alcohol level, strong acidity and dry tannin. This is a zesty, seedy and angular wine – a bit acrid, a bit tannic and quite extracted. The wine has a fair overall balance – it has a nuanced fruit-forward profile, a clear example of it’s new-world ideology – velvety and quite fresh. The wine has a medium finish and a balanced aftertaste. It’s acrid and astringent towards the end, but it leaves a quite pleasing feeling overall. Conclusion: this wine is still too young to drink now, we would recommend to keep it a little longer for bottle ageing, as it display a good ageing potential, but is still too angular and too zesty. Time will round up its edges and will soften its overall profile. We would also like to mention that this wine was made in a new-world style but with an old-world technique, as it displays a clear fruit-forward profile, while the grape varieties used to make the final blend are well renown for their earthy-savory aromas in their homeland.